You're probably coming from the amazing Amy's blog and if not, you can head over the The Classroom to start from the beginning so you don't miss anything! And while you are there make sure to leave a comment because to celebrate the new set, two randomly selected commenters will win a $30 gift certificate to the Ellen Hutson shop! To enter just leave a comment on the Ellen Hutson Classroom blog by 11:59 PST on January 28th. 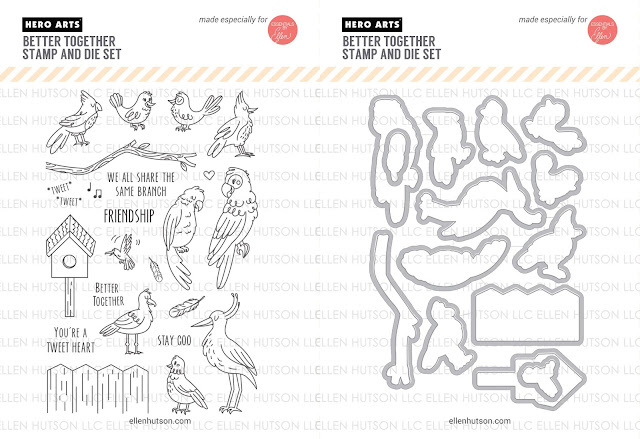 When I first saw this set, I loved the sweet little loop-de-loop details on many of the birds. I wanted to recreate it so I used Copic markers with acetate cards. I used the Spectrum Noir Clear Sparkle pens to watercolor with the Daniel Smith dot palette Hero edition. Using the sparkle pens to watercolor is so fun! The pics can't really capture how sparkly my birds are. Alcohol inks on acetate are awesome! I die cut 4 hearts for each card to hide any adhesive and provide a place for writing on the inside of the card. Thanks so much for stopping by and keep on hopping over to Carolyn's fantastic blog! I need to try acetate for cards. Thanks for the ideas! I love your tip on the doodling, I'm going to try it today. Cute. I like the loop-de-loop detail on the acetate. Really loop de like the loop background on this acetate. Your little birds are so cute and colourful, you can't help but love them. Unique cards! Love all of them. I love the doodle lines! These are so fun! Love the birds! These are really really fun! Carly, what a FANTASTIC idea!!!! Your cards are wonderful and I am definitely going to try this! TFS! 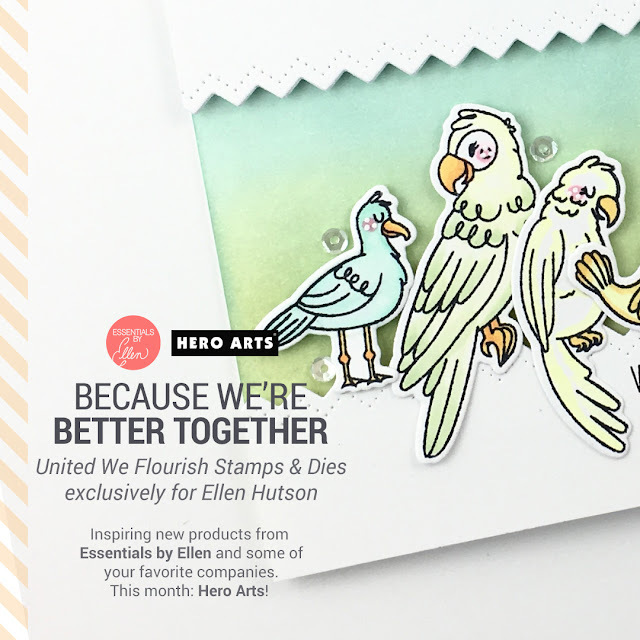 Love the United We Flourish stamp set BETTER TOGETHER! Great cards, I love the doodling on acetate element! Nobody goes loop-de-loop like you, sweet Carly! Let's be perfectly clear... LOve your darling acetate cards, and your bird colors! Love that you used acetate for the cards---really allows your beautiful coloring to pop! Thanks for all the tips for these really awesome acetate cards. What a cool design! Love those loops & the beautifully colored birds. An awesome card! Great idea, using Copics on the actetate as a background.